Haley Sumer Burciaga obituary. Carnes Funeral Home. Jun 17, 2012 The Carnes Funeral Home Staff offers our sincerest condolences to the entire Burciaga family. It was our honor to serve your family. Haley Sumer Burciaga was born a sweet princess in Houston, Texas on June 16, 2003. 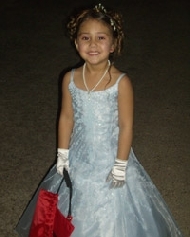 She moved her "princess castle" to heaven on February 9, 2011. Our princess will forever live through “Big Guy Daddy” (Christopher Burciaga Sr.), “Mommy” (Dafney Burciaga), and little brother “Oobie” (Christopher Jr.). Hailey Bear had lived in Webster for 2 years and in Texas her whole beautiful life. She was proud to tell you "I'm a southern belle". She was a beautiful actress, outstanding artist, wonderful comic, graceful dancer, and so many other wonderful things. Most of all she loved life and this world. She was the best friend we all were lucky enough to have. She loved music, animals, fashion, makeup, all things princess and glittery, but most of all she loved her family. The most missed things about Hailey will be her heart love, and warm caring eyes. She leaves behind no one because she will NEVER leave any of our hearts. Never forgotten and forever loved is our Hailey Bear. A Celebration of her life will be held at Carnes Funeral Home in Texas City. A gathering of family and friends will began at 4 P.M. and the Celebration will follow at 5:00 P.M. on February 14, 2011.